Behind Ethiopia-Eritrea peace deal, quietly in the background, is the delicate role of the UAE in helping bring peace to a neighborhood sundered by war, says Abu Dhabi-based daily The National. ABU DHABI (WAM)―The peace deal brokered earlier this month between Eritrea and Ethiopia startled international observers and delighted residents of both east African nations, said The National in its Wednesday editorial. “After 18 years of military tension and diplomatic isolation, one analyst summed it up well while speaking to The National: ‘It’s phenomenal’. But two weeks later, the details of the groundbreaking peace deal continue to emerge. 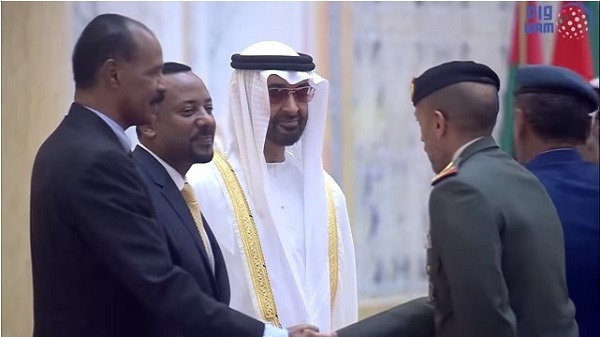 Today’s joint visit to Abu Dhabi by Ethiopian Prime Minister Abiy Ahmed and Eritrean President Isaias Afwerki sheds some light on the role the UAE seems to have played in helping both countries conclude a war that claimed more than 70,000 lives,” it added. “As the two leaders penned the deal on 9th July, UAE Minister of State for Foreign Affairs, Dr. Anwar bin Mohammed Gargash, tweeted: ‘Through years of hard work to support political continuity with Eritrea and Ethiopia, the UAE has become an esteemed partner in the Horn of Africa and is the leader of the Arab presence in this important region’. It followed the AED11 billion aid package granted to Ethiopia by the UAE last month. This is a victory for quiet diplomacy, the likes of which the UAE has finetuned in the Horn of Africa, a strategically crucial region blighted by decades of conflict,” the English language daily continued. It went on to say that the two leaders, who managed to end a seemingly intractable conflict, were both awarded the prestigious Order of Zayed. “Named after the UAE’s Founding Father, it is a rare honor of significant magnitude, recently awarded to Chinese President Xi Jinping, a great and powerful ally. By bestowing this honor on both leaders, this country’s rulers have reaffirmed their hopes and faith in a lasting peace and prosperity in the Horn of Africa, where they have strong alliances. “And that is the great virtue of the landmark Ethiopia-Eritrea peace agreement. Traditionally the two foes have taken different sides on regional disputes – including in troubled Somalia – dealing a blow to hopes for regional peace. With the two united in promoting peace alongside the UAE, we can expect a so-called security dividend. “Ethiopia now finds itself well placed, for instance, to mediate in the border dispute between Eritrea and Djibouti. Ultimately the peace will be most beneficial for the people of Eritrea and Ethiopia, who are enjoying reintroduced travel, communications, diplomatic and trade links. But behind their joy, quietly in the background, is the delicate role of the UAE in helping bring peace to a neighborhood sundered by war,” the Abu Dhabi-based daily concluded.